Dry, in rocky or sandy soil, and moist, in sphagnum bogs. Woods, forests, bogs, rock outcrops, sand barrens. Light shade. 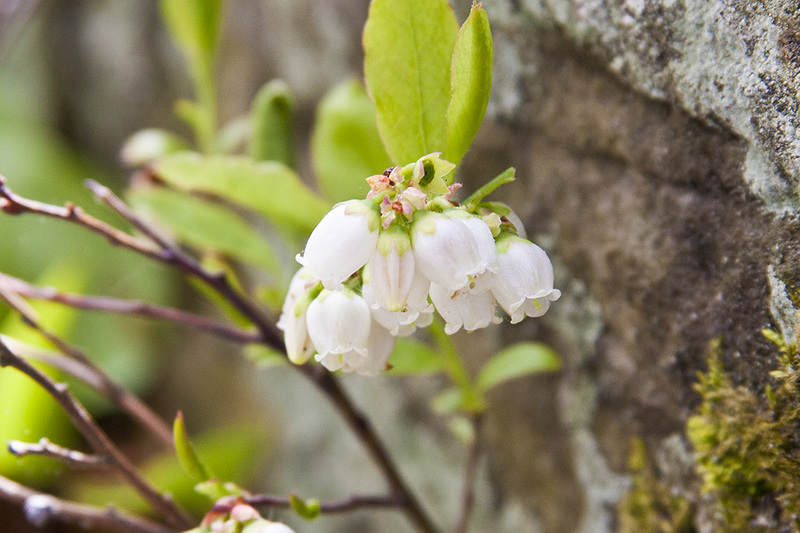 This is a deciduous, low-growing, 12″ to 20″ tall, erect, perennial shrub. It rises on one or a few stems from a shallow, fibrous root system and sometimes a taproot. It spreads by woody rhizomes and often forms dense colonies. First-year stems are erect and green. They have scattered, wart-like elevations and are sometimes covered with a whitish, waxy coating (glaucous). They are hairless or have scattered, short, curved hairs. The leaves are deciduous, alternate, and stalkless or short-stalked. The blade is narrowly elliptical, ⅝″ to 1⅝″ long, and ¼″ to ⅝″ wide. It is ⅓ to ½ as wide as it is long. It is tapered at the base and tapers to a point at the tip with a short, sharp, abrupt point at the tip. The upper surface is dark green and may be hairless along the main vein but is otherwise hairless. The lower surface is pale green and hairy along the main vein or hairless. The margins are toothed with regular, minute, sharp, forward pointing teeth, and sometimes have a fringe of scattered, short hairs. The teeth have a stalked gland at the tip. The inflorescence is a crowded, unbranched, elongated cluster (raceme) of 2 to 15 flowers at the ends of branches or rising from leaf axils. The flowers are 3 ⁄16″ to ¼″ long. The 5 green sepals are fused at the base into a calyx tube and separated at the tip onto 5 broadly triangular lobes. The calyx tube is hairless and glaucous. There are 5 usually white, sometimes pale pink petals. The petals are fused nearly their entire length into an cylinder- or urn-shaped corolla tube, then separated at the tip into 5 short lobes. The lobes are shorter than the tube. There are 8 to 10 stamens on flat, hairy filaments. 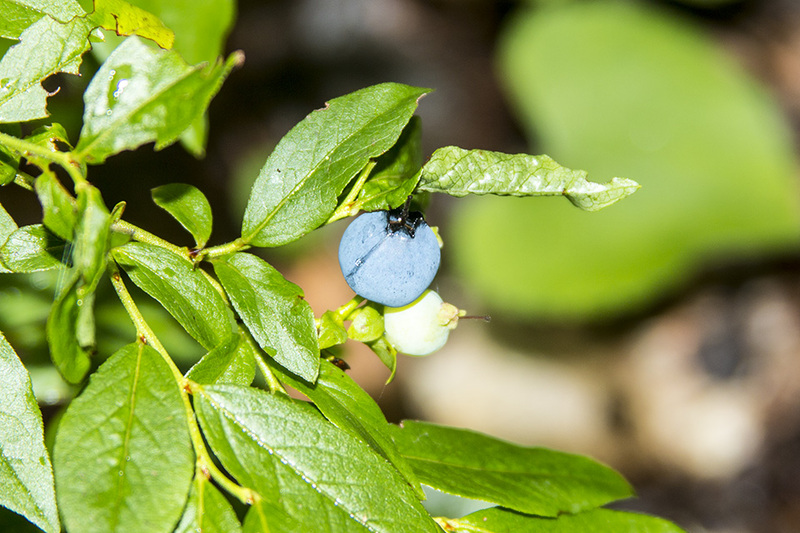 The fruit is a fleshy berry with 10 to 15 seeds. 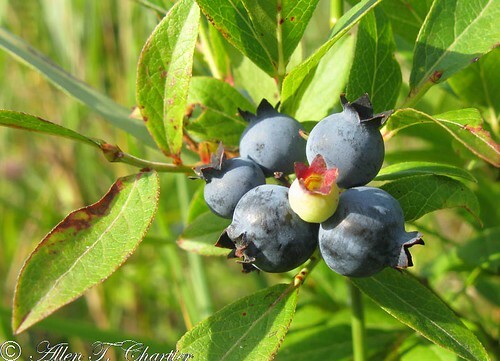 The berry is globe-shaped, ¼″ to ⅜″ in diameter, hairless, and usually blue, sometimes black. 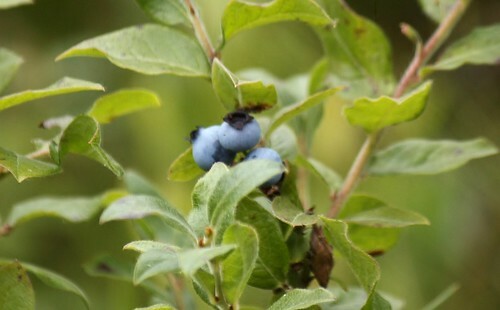 The berries ripen late July to early September. 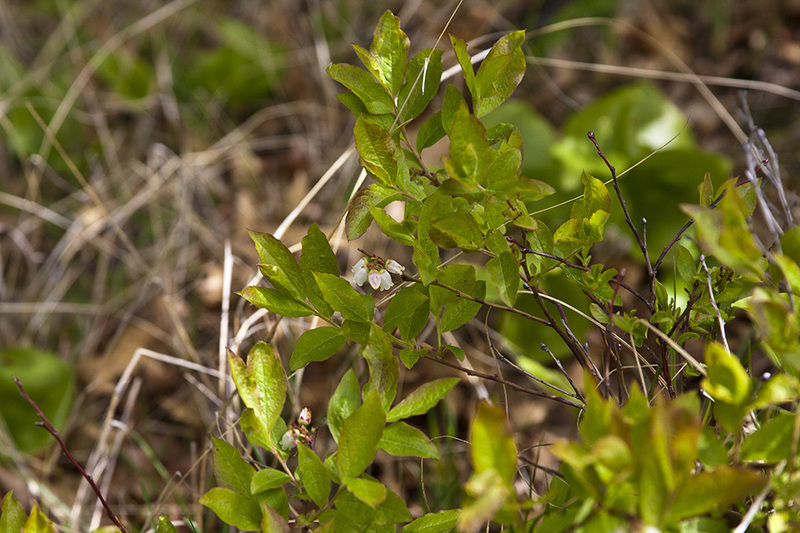 Bog bilberry (Vaccinium uliginosum) leaf blade is shorter, no more than ⅞″ long. It is broadly elliptical, sometimes almost round. The margins are untoothed. 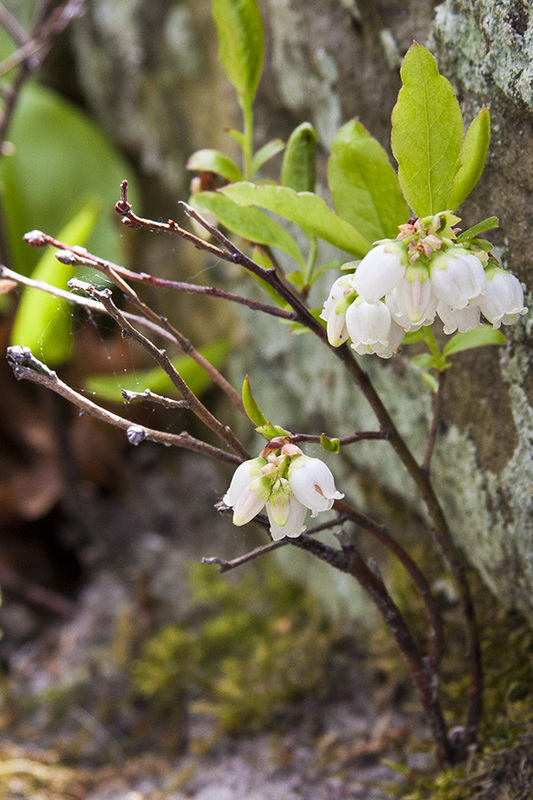 The flowers are borne singly or in pairs. 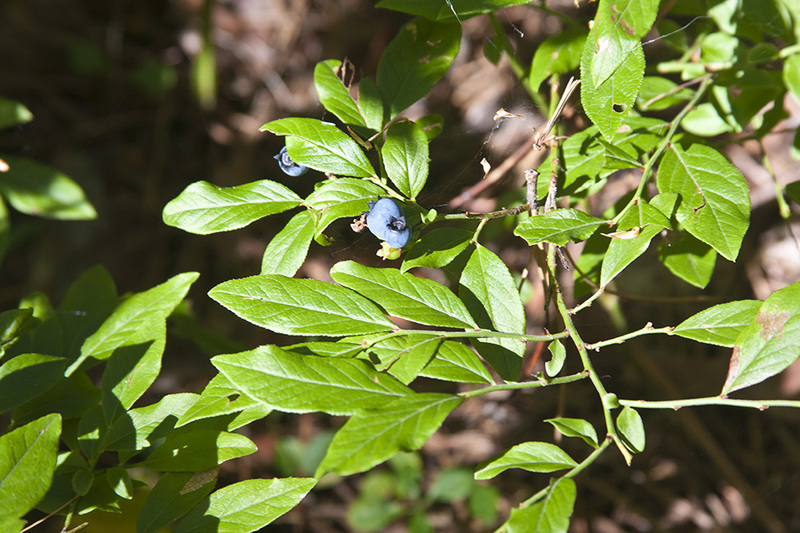 Velvet-leaf blueberry (Vaccinium myrtilloides) twigs are densely hairy. The upper and lower leaf surfaces are densely hairy, though sometimes only along the main veins. 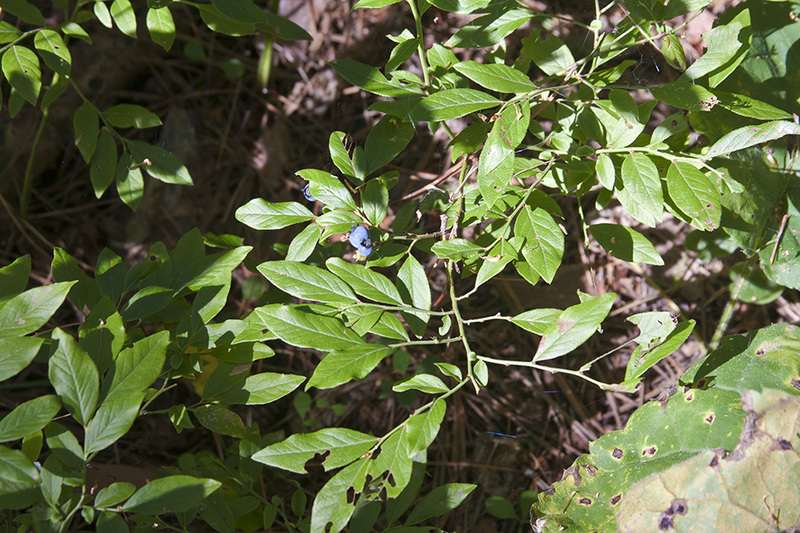 The leaf margins are untoothed and have a fringe of long hairs. The thread-like stalk of a stamen which supports the anther.